Today is Children in Need Day (for those not in the UK, Children in Need is a charity that many people fund raise for once a year, ending in a television special, which airs tonight). 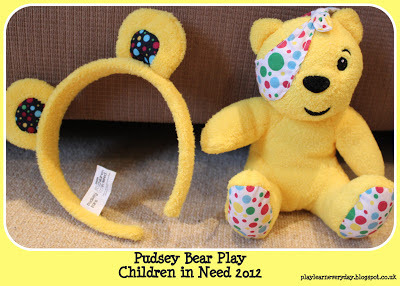 The character that represents Children in Need is Pudsey Bear. We got a Pudsey Bear and some Pudsey Bear ears for Ethan to play with and wear today. Unfortunately for me, Ethan will not keep the ears on (but they look so cute!) but he does enjoy playing with Pudsey Bear. We spent this morning taking care of Pudsey, because he has a sore eye. We also bandaged up his arms and legs (poor Pudsey) and gave him lots of cuddles. This enhances Ethan's 'Personal, Social and Emotional Development' as he learns to care for someone and to play gently with him.